WORKTECH19 Bengaluru is the forum for all those involved in the future of work and the workplace as well as real estate, technology and innovation. 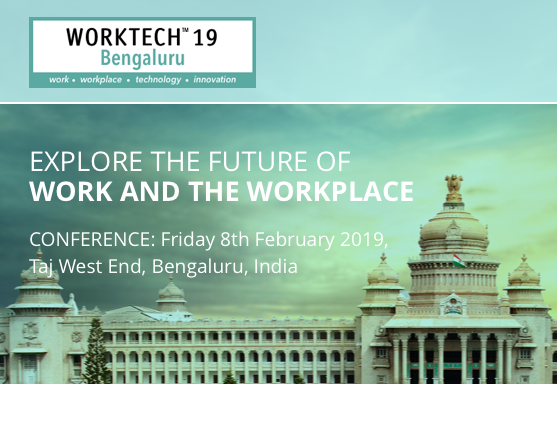 WORKTECH19 Bengaluru will attract some of the biggest and brightest names to debate, discuss, and divulge the latest thinking on the Future of Work and the Workplace. We will focus on technology, innovation and new ways of working, and will bring global best-practice, thought-leadership and case-studies from Europe, APAC and the US. Join our community of senior professionals from real estate, facilities, HR, technology, executive management architecture, design and professional advisors to listen to global thought leaders, further their knowledge and share best practise and expertise.